No to DoTA: Should 'Defense of the Ancients' be banned in PH? Home / tech news / trending topic / No to DoTA: Should 'Defense of the Ancients' be banned in PH? The phrase "No to DoTA" became a Twitter trending topic on Sunday night after a TV show featured a relevant story about the computer game. In its January 25 episode, GMA-7's multi-awarded news magazine program "Kapuso Mo, Jessica Soho" aired a report explaining why the highly-addictive game Defense of the Ancients was banned in a village in Dasmariñas, Cavite. It was announced by Barangay Salawag chairman Eric Paredes that the local council approved an ordinance prohibiting the availability of DoTA in internet shops, saying two players already died due to the computer game. 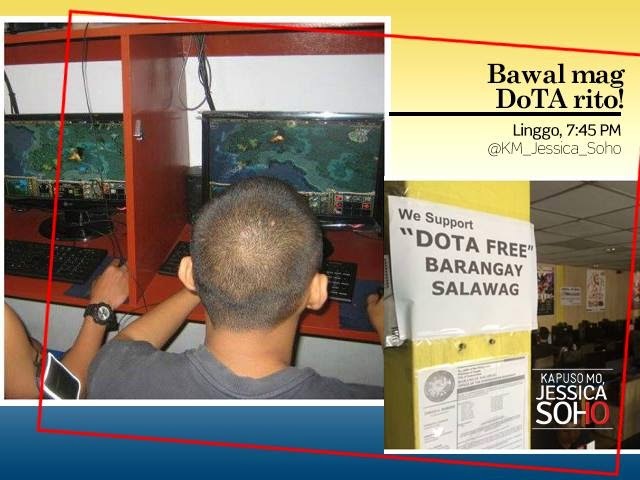 A provision in the measure, which was given by barangay officials the green light earlier this month, stated that DoTA has been the cause of trouble not only inside computer shops but in the community and homes as well. Because of DoTA, youngsters became violent and have learnt to steal money to be able to play, they said, adding that the game also distracts kids from their studies. Computer shops caught violating the local ordinance will be slapped with a 2-month suspension (first offense), closure (second offense), and revocation of barangay business clearance (third offense). Parents in the barangay are said to be supportive of the measure. Now, rumors have it that the No to DoTA campaign will go nationwide. According to some netizens, local government units (LGUs) from other parts of the country are also planning to ban the game.